Suanne and I was thinking of going to Turkey and Greece for our gastronomic-slash-cultural vacation this year. It will be an easy thing to do for Suanne and I because it is just $500 for airfare and 3 nights free accommodation. That’s a great thing about working in my company because we get all these inter-line arrangements. The only issue is that the flight is on standby basis. It is easier to deal with, with just two people but with four people it is trickier … a lot more trickier. We’ll see how things go too because the boys summer plans are still not firmed yet. So I had been talking a lot to Sena at the office. She is Turkish and I was so interested in learning more about Turkish culture and food in anticipation of the trip. I told her about this Turkish restaurant near the office that I wanted to visit. She was surprised because she had not heard of it before. I told her to get some people together for a Friday lunch. She did … 20 people! I was thinking of just 4 or 5. So we all drove over to Anatolia’s Gate. It is too far to walk from where our office is in the Metrotown area. Anatolia’s Gate is located across the street, kitty corner from the Middlegate Shopping Center (Google Map here). There are available street parking on Kingsway or the side road, so that was not an issue despite us driving there in a number of cars. The name Anatolia invokes a lot of thoughts of Turkish history. The name Anatolia is another name for Asia minor and refers to that historical region in Turkey that used to be home of many many civilizations which includes Greek, Armenian, Roman, Byzantine and Ottoman. I love history and look forward to going to this part of the world to see first hand for myself. 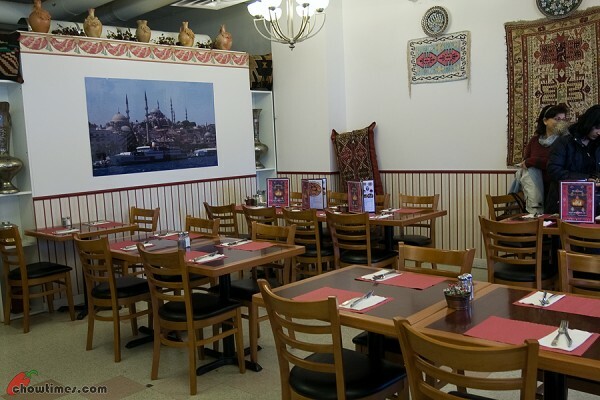 Anatolia’s Gate has an open gas oven. You would not miss it because it is right in front of you as you step into the front door. 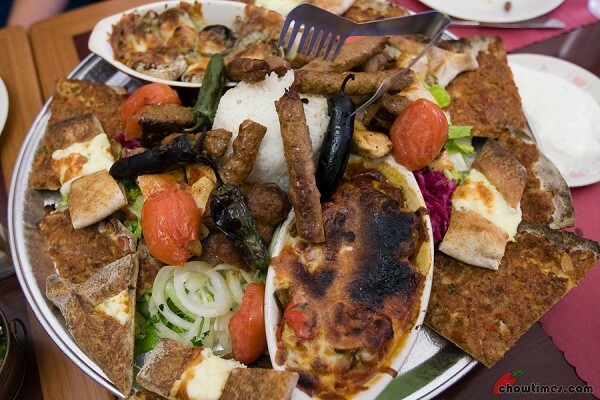 According to Sena, this is all essential if they want to do Turkish dishes right. 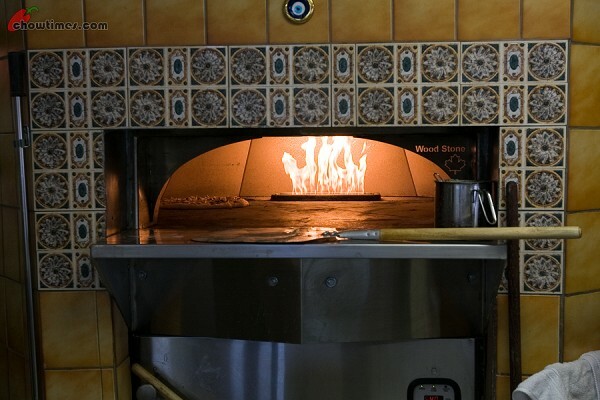 The ovens are used to make the excellent Turkish flat bread pizza (called Lahmacun) and Pide. They also use this to make Lavash. The interior is quite basic with well arranged tables. This allows them to easily arrange the tables for bigger parties like ours. While Anatolia’s Gate is spacious, they recommend reservations because they do have big parties coming in every now and then. 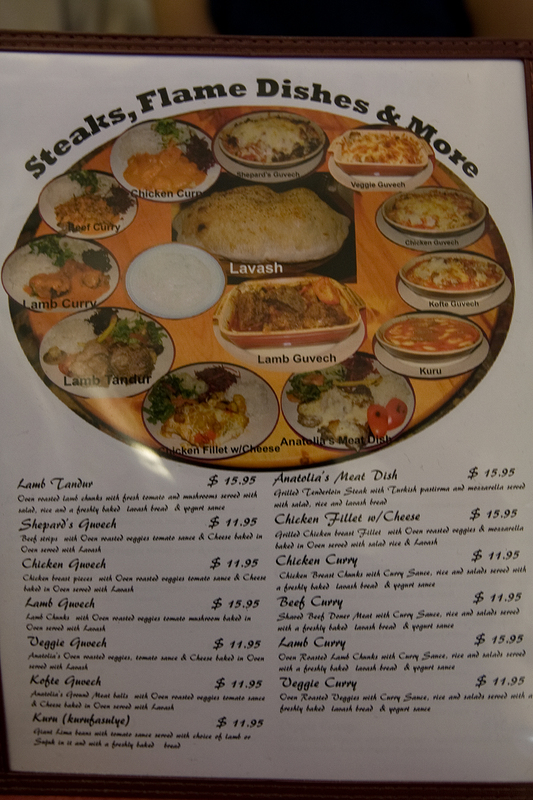 The menu is all foreign to all of us. We surrendered ourselves to the advice of Sena. You know how some of us decide what to get? 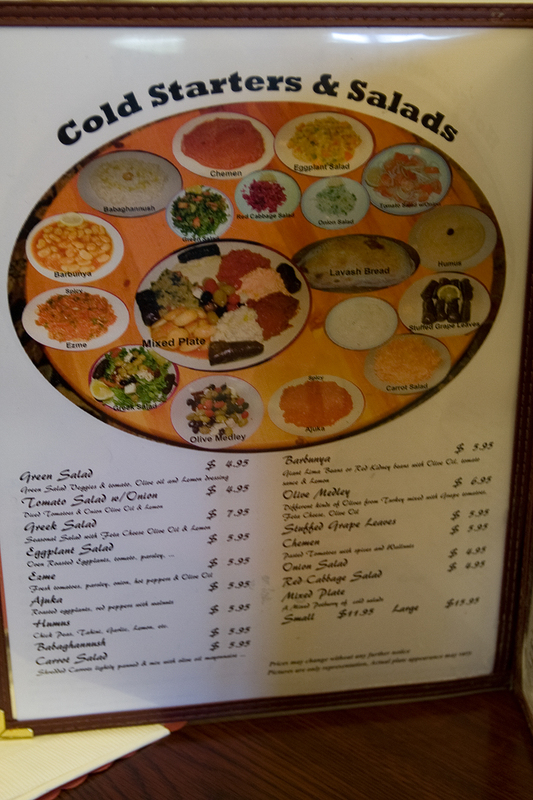 We just have to point to an item on the picture menu and ask her about it … and she will go “Oh … wow” and raise her eyebrows before excitedly explaining it to us. I don’t have to even listen to her description … just judging by how long she drags out her “wow” and how high her eyebrows were raised is enough indication on what to get. I just love having an expert telling me more about the food. I always find that the more I know of the food and the culture the more I appreciate it. That’s me — food is not just something I enjoy but also the learning. Actually I was already dead set on getting “The Works” (my term). See above. I almost did not pull this off because not many people wanted to eat so much. Moreover, at $21.50, it is understandably too expensive to spend on lunch. At the end, we got the minimum four to go for this. This was gonna be a feast … and we regretted getting this. So anyway, I decided to get this thing. 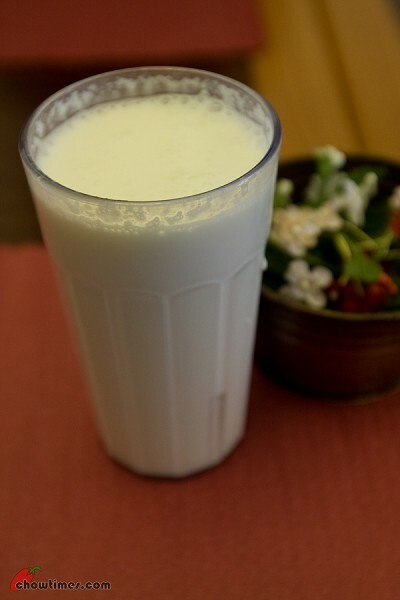 This is called Ayran which is made of yogurt and water and costs about $2-$3. It tastes like the Indian Lasi (spelling?) to me and really thought it’s the same thing. Sena said that it is very Turkish. In Turkey apparently. they like to have this made bubbly, more bubbly than the one you see above. Our $21 per head platter includes the appetizers above. 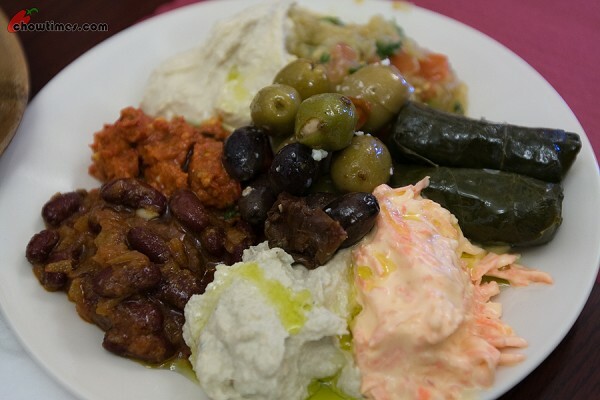 They are cold appetizers (called meze) and are mainly used as a spread on bread. Our favourite was the red one at the top left corner. It is called ezme and has a more stronger flavour because of the spice chili used. The dolma (top right) is stuffed grape-leaf. 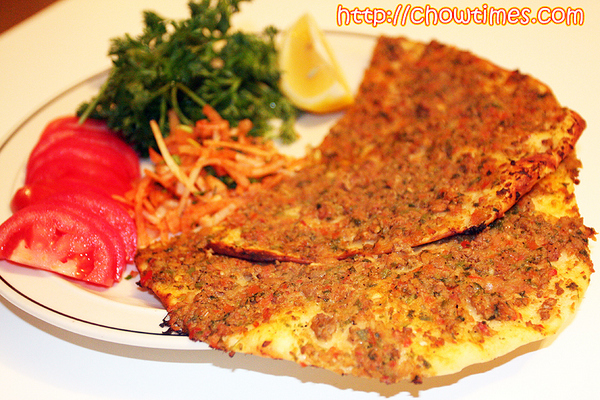 It is very popular around the region from Iran to eastern Europe to south Asia but this originates from Turkey. 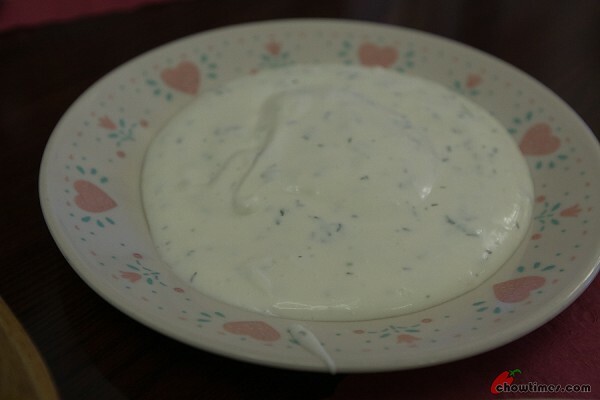 The above is some yogurt with herbs. I am not sure what this is called — just yogurt? Anyway, this is meant to go with Iskender kebab. Everyone gets the Lavash. This is interesting. It is bread all puffed up cooked on the open oven. 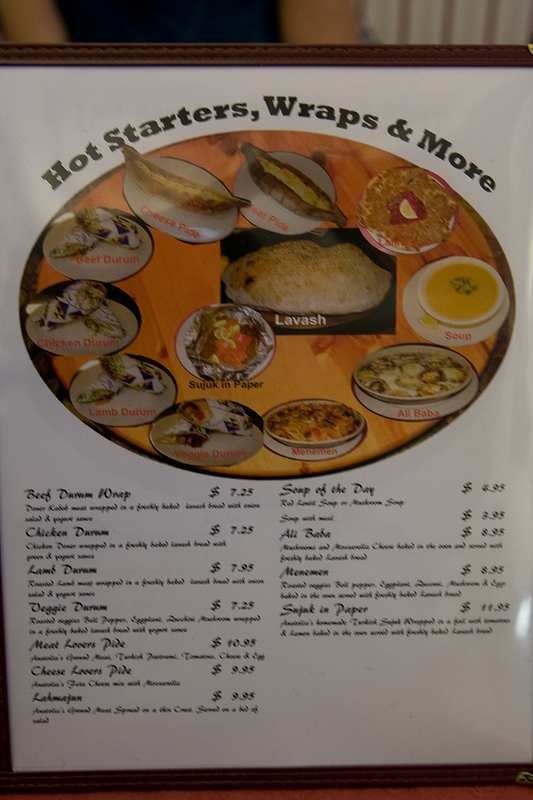 A stab at the Lavash releases steam. 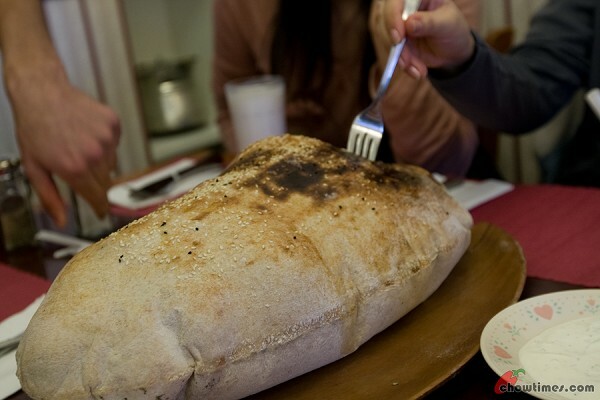 Sena said that the Lavash is not Turkish. 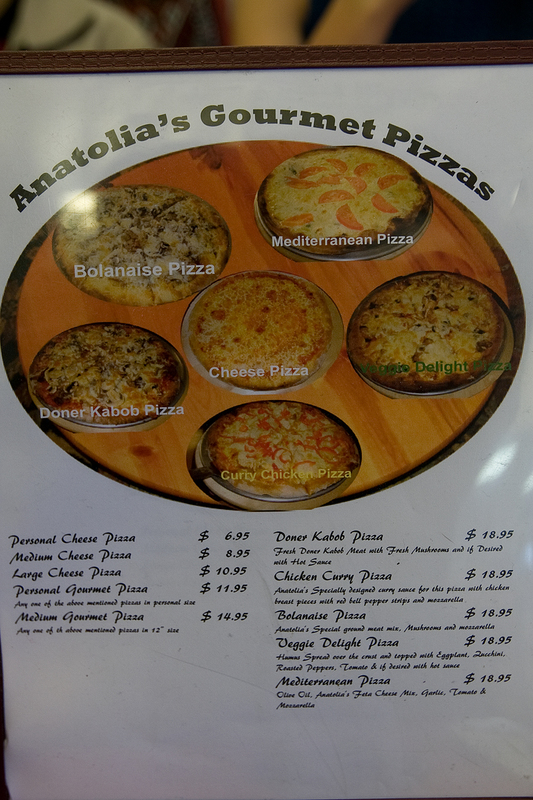 It is Arabic but Anatolia made it because they had the oven necessary to make this. 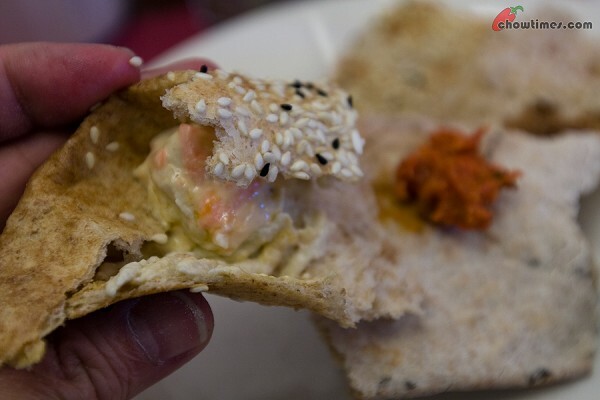 The Lavash and the Meze’s goes very well together. 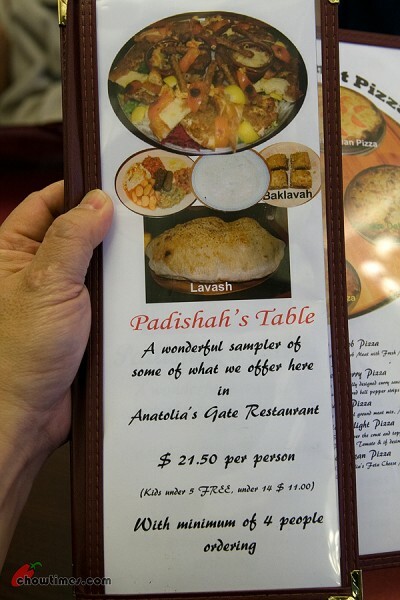 Everyone enjoyed this particularly when the Lavash is still hot. I could eat this entirely as a meal. Updated: 18th Dec 2014: This restaurant is closed. 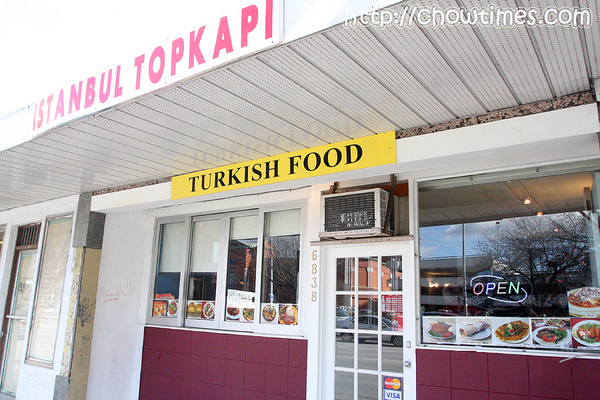 Istanbul Topkapi is a new Turkish restaurant which located across Richmond Centre. It has opened for about 2 months. Nanzaro told me that the food smelt good while he was waiting at a bus stop right in front of the restaurant. 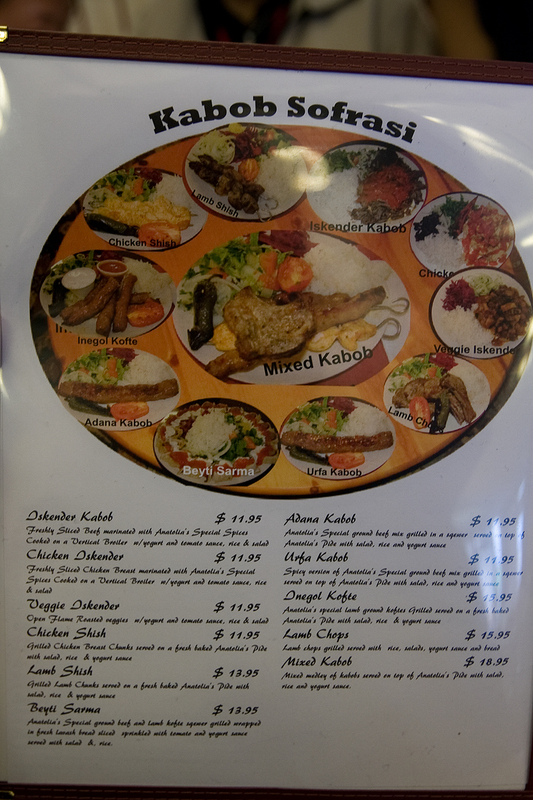 Polly and I decided to try out this Turkish restaurant for a change instead of going out for our regular sweet treats. Since the time we sat down, we saw numerous buses stop by the bus stop in front of the restaurant. It should be a good location for someone who wants to grab a bite but so far, I dont see many customers walk in while we were there. In fact, there are only two other customers when we were there. However, the restaurant owner told us that they are more busy at dinner time. After we had sat down and handed the menu, we had no clue of what to order. Polly and I were curious at the name of a beverage called Ayran and we asked the restaurant owner what it is. 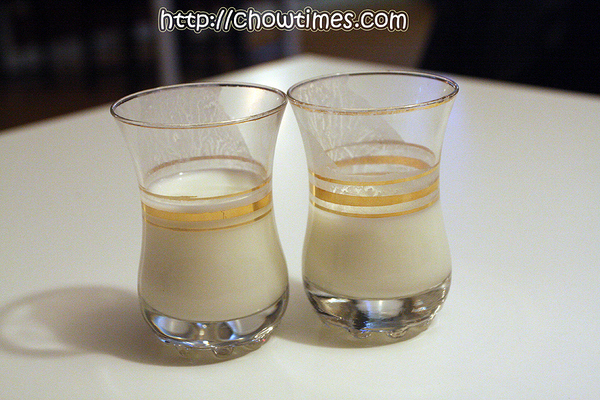 The restaurant owner told us it’s a kind of yogurt drink and kind enough to give us a small glass to sample. It is indeed taste like yogurt and quite sour. The regular size Ayran costs $1.99.